Sunday saw the finale of the World Rhythmic Gymnastics Championships, held for the first time in Moscow. The pressure was high as the country is the clear trendsetter in the sport. “A lot is being done to make this sport even more popular here. We dominate rhythmic gymnastics around the world. It's easy to work with the Federation, a real pleasure,” said Russia’s Sports Minister Vitaly Mutko. ”Many of our coaches work abroad to increase the standard of gymnastics worldwide. Nevertheless, we should continue the progress of the sport and we have a project for its development,” he added. With a tally of eight golds, five silvers and one bronze medal, Russia absolutely dominated the 30th World Championships. The Russians have always set the bar high for their challengers, and on this occasion no nation came close to emulating them. Evgenia Kanaeva proved why she is simply the best, overshadowing the field with her flawless routines. 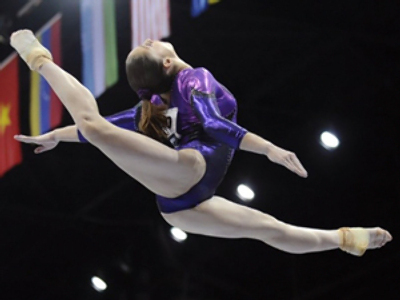 The 20-year-old gymnast added three golds and a silver to her medal cabinet. However, the Olympic champion can't be fully satisfied with her results as last year Kanaeva won five gold medals. And sensationally, the Siberian native did not reach the final of the ribbon event. That honor went to Daria Dmitrieva, who along with Daria Kondakova showed they are more than ready to challenge Queen Evgenia for a slice of her empire. Competition is fierce for a place on the national team, and that can only be a good thing ahead of the Olympic Games in London in two years’ time. Russia climbed atop the podium in all but a single group final, losing to reigning champions Italy in one of the three deciders. “We are very pleased with our performance and the result. I don't think we could even dream of getting a higher score. It's extremely hard to compete with the Russian team, so I think we did very well,” said Anzhelika Savrayuk from team Italy. Looking back over the six days of the World Championships, the inaugural games held in Russia were an obvious success for the hosts, a fact which bodes well for a record haul at London 2012. Vancouver Games over, Sochi’s next!